FORMAT: Shadow Study is the first book in the Soulfinder Series. It takes place approximately six years after the last Study Series book. It could be read on its own, but it is best if it is read after you have read the Study Series and then the Glass Series (spoilers to these series will be inside the book). 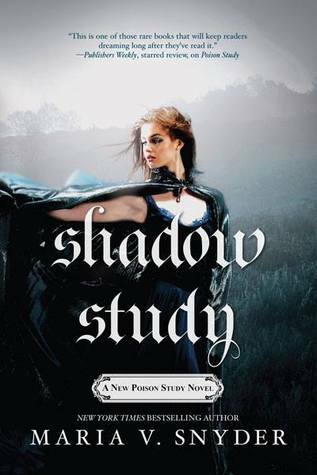 Shadow Study is a YA fantasy romance. It stands at 384 pages and was published by Mira on February 24, 2015. ANALYSIS: The minute I read Maria V. Snyder's first series of books – The Study Series – I was obsessed. I loved not only the characters, but the world building. The series was quick, satisfying, and fun to read. After finishing that series, I quickly read all of her other books and enjoyed them just as much. So, imagine my surprise when I discovered that Snyder was taking readers back to the characters that started it all – Yelena and Valek. I was thrilled. Unfortunately, that thrill did not carry over to the series. Reviewing Shadow Study, for me, is going to be difficult. I wanted to love it. All of Snyder's other books – The Study Series, The Glass Series, and The Healer Series – I loved. Sadly, I do not feel that the first book in the Soulfinders Series is Snyder's strongest book. I didn't dislike the series and I feel it is great for fans of the series, but I am left with mixed emotions. Fans of Snyder's original series will certain enjoy reading Shadow Study. Everyone's favorite characters are back and facing situations that seem all too similar. It was this part of the book that I did enjoy. I liked revisiting some of my favorite characters, seeing what they are up to, and how they have grown and changed. There were even a few new characters that helped keep things slightly new. Now comes the part that has caused me mixed emotions. Snyder is trying something new with this book. She allows readers to follow three different characters – Yelena, Valek, and Janco. This is where I think the momentum from previous series was lost. Two of the POVs – Janco and Valek – are written in third person, while Yelena's is written in first person. This constant jump between writing styles caused the book to have a fractured feeling to its flow. A reader just gets used to a certain POV and they are quickly jumped to another POV with a new style of writing. There was also something that felt off with Janco's sections. He felt sort of thrown in there just to be thrown in there. His sections were pretty short, but every time I came to them, I dreaded reading them which was sad, because he had some pretty good conversations and one-liners in the past (and even occasionally in Shadow Study). It wasn't just the style of writing either that made things feel fractured. There was the jump in times. Valek's sections take readers back in time to his training as an assassin. While this story was interesting and something I have personally wondered about, it felt misplaced. It came across like another book was being shoved into this one. I think, if each of these sections had been published separately, it would have made for a better experience. Instead, it felt like three separate books shoved into one edition. If it was needed to put them all into one book, I think it would have helped to maybe have two POVs and keep them in the same tense. It would have been less disruptive to the flow. Now, on to the other aspect that was a bit disappointing. Shadow Study leads readers on Yelena's journey to discover why her magic is blocked. She is left defenseless and unable to access her magic. Sound familiar? Yes. This is so similar to the last book in the Glass Series, that it was distracting. I am sure the reason for her blocked magic will be revealed and it will be different than the Glass Series, but the similarities between the two books came across as 'same story, different characters' vibe. Overall, I don't want to say Shadow Study was a bad book. It wasn't bad. It just didn't come across as Snyder's best work. Fans of her previous series will certainly love it and in the end, that is all that matters. In regards to my feelings, I was disappointed and hoped to see the momentum carry over from the other series. It isn't enough to make me stop reading the series, but I do hope to see the rest of the Soulfinders Series improve. Consider it more of a rocky start. Snyder can – and probably will – recover from it.